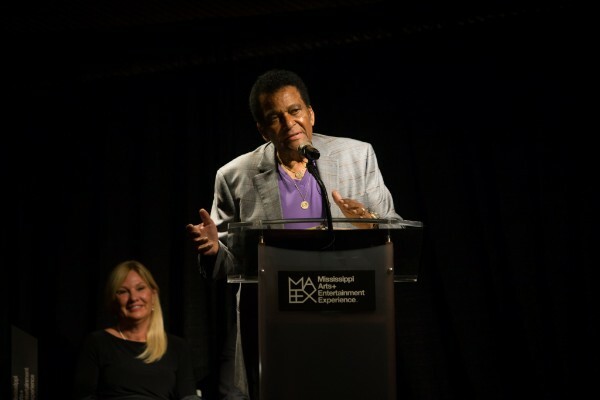 CHARLEY PRIDE SELECTED FOR THE MISSISSIPPI ARTS + ENTERTAINMENT EXPERIENCE HALL OF FAME CLASS OF 2018 | 2911 Enterprises, Inc.
MERIDIAN, Miss. – Country Music Hall of Fame member and Mississippi native Charley Pride, was honored with another industry accolade recently, celebrating his legendary career as a pioneering Country musician. Pride was inducted into the Mississippi Arts + Entertainment Experience Hall of Fame class of 2018, on August 25th in Meridian, Mississippi, along with four other recipients; singer-songwriter Jimmy Buffett, Photographer William Eggleston, Writer and editor Willie Morris, and Blues musician Howlin’ Wolf. Pride also received a ‘Walk of Fame’ star as part of the ceremony. Charley Pride was born in Sledge, Mississippi to a sharecropping family, and was raised from humble roots on a farm. Pride’s love of country music was fostered by Grand Ole Opry broadcasts on WSM radio. He saved money for almost a year to purchase his first guitar at age 14 – a Silvertone model from Sears & Roebuck. In 1966, Pride was signed by Chet Atkins to RCA Records, where his gritty, Southern-accented baritone voice made him a superstar. Pride has received three Grammys, three Country Music Association awards, an Academy of Country Music Pioneer Award, Country Music Hall of Fame and Grand Ole Opry inductions and a Recording Academy Lifetime Achievement Award. His 52 top-10 hits include “Is Anybody Goin’ to San Antone,” “Mississippi Cotton Picking Delta Town,” “Burgers and Fries,” “Roll On Mississippi” and others. The eighteen other Mississippi artists inducted into the Hall are: painter Walter Inglis Anderson, writer William Faulkner, actor Morgan Freeman, writer John Grisham, puppeteer Jim Henson, bluesman Robert Johnson, actor James Earl Jones, bluesman B.B.King, potter George Ohr, entertainer Elvis Presley, opera singer Leontyne Price, musician Jimmie Rodgers, bluesman Muddy Waters, actor Sela Ward, writer Eudora Welty, playwright Tennessee Williams, Entertainer Oprah Winfrey, and writer Richard Wright. Oct 12 – Grand Ole Opry / Nashville, Tenn.
Oct 13 – Grand Ole Opry / Nashville, Tenn.
Oct 19 – Morse Center / The Villages, Fla.
Dec 01 – Jackpot Junction / Morton, Minn.
Charley Pride is celebrating more than 50 years as a recording artist, and his latest album release, Music In My Heart. Pride has enjoyed one of the most successful careers in the history of country music and is credited with helping to break color barriers by becoming the first black superstar within the genre. A true living legend, he has sold tens of millions of records worldwide with his large repertoire of hits. A three-time GRAMMY® award and Recording Academy “Lifetime Achievement Award” winner, Pride has garnered no less than 36 chart-topping country hits, including “Kiss An Angel Good Morning,” a massive #1 crossover hit that sold over a million singles and helped Pride land the Country Music Association’s “Entertainer of the Year” award in 1971 and the “Top Male Vocalist” awards of 1971 and 1972. A proud member of the Grand Ole Opry, Pride continues to perform concerts worldwide and has toured the United States, Canada, Ireland, The United Kingdom, Australia and New Zealand over the last several years. For more information, visit CharleyPride.com. The MAX is a first-of-its-kind multimedia tribute to the rich culture of creativity and the legacy of artists from all mediums who have called Mississippi home. The immersive exhibits at The MAX take you behind the scenes at the birthplace of the stars. Visitors learn how Mississippi and her people have influenced artists of all avenues and how these artists then influenced the world. Charley Pride inducted into @msartsorg #MAXHallofFame class of 2018 along with @jimmybuffett, Willie Morris, William Eggleston & Howlin’ Wolf.